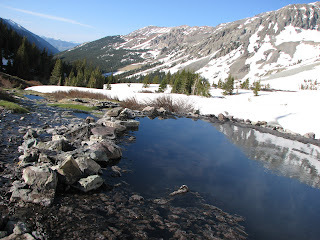 Over the weekend, we packed into Conundrum Hot Springs. We had heard reports of deep snow and impassible creek crossings, but we decided to see how far we could get. Turns out that while the snow was deep in places, it was certainly possible to make it into the springs. 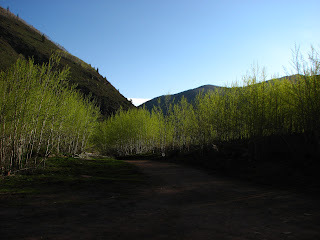 At the trail head the aspen leaves were just coming out. 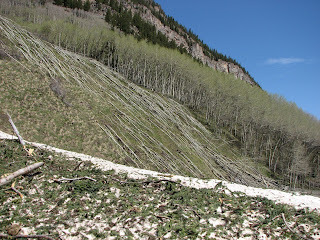 The conundrum creek valley was hit pretty hard by avalanches over the winter. We crossed numerous run out zones and saw lots of downed trees. Not too often that you don't have to share the hot springs with anyone else. 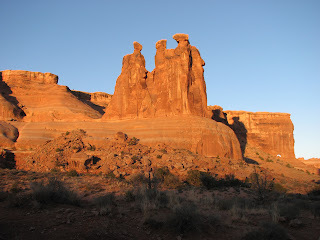 Every trip to Moab seems to include a stop into Arches National Park. 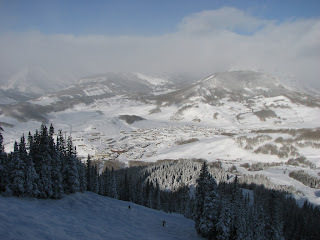 With scenery like this it's almost impossible to stay away. I believe this formation is called Courthouse Tower. Here are the Three Gossips. 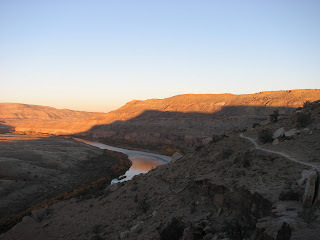 Cooler days in the mountains of Colorado signal that it's time to start heading west to the desert so some friends and I headed to Fruita to mountain bike the Kokopelli's Trail. I rode from the Loma trail head and called it a day after riding to Dewey Bridge. I would have liked to have ridden further, but I wasn't looking forward to the riding the impending up hill alone at night. Besides that, I was tired after riding for 9 hours. 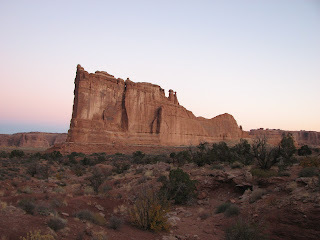 There's some amazing riding along the trail and I'm looking forward to riding the last section into Moab sometime soon. Today marks the 5th time that I've run the Pikes Peak Marathon. Today's performance wasn't as fast as previous years, but it was still a fun race. Race data from my Garmin Forerunner 305 is at motionbased.com. 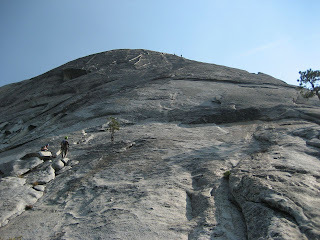 Our main object for the weekend was to climb the classic line on Half Dome called Snake Dike (5.7R). In this picture, LLewellyn and Olivia are just starting out up the first pitch. 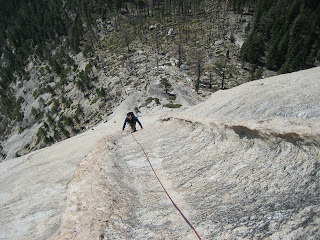 A couple of other climbers can be seen several pitches up on the route. Here's what the route looks like from several pitches up. Don't bother bringing much gear, because as you can see in the picture, there's no place to use it.